Please call Southern Seeds by Friday, April 15th at 1-800-682-1102, so we can make adequate accommodations. 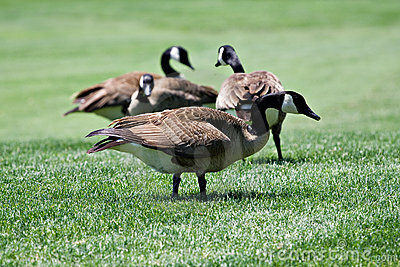 Canadian Geese Nesting Coming Soon! Canada Goose nesting season is rapidly approaching here in the Carolinas, it is now possible to “addle” eggs during the incubation period. In order to do this legally it is necessary to visit the linked website and complete the required permit. Coating the egg with corn oil provides the best results. You can simply apply the oil with a spray bottle to completely coat the surface. A north Scottsdale couple feel lucky to have made a rare sighting of three mountain lions this week on the fourth hole of Desert Mountain Golf Club’s Cochise Course. 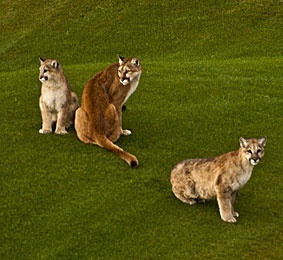 Desert Mountain resident Linda Borman said she quickly snapped a few photographs on Monday afternoon after her husband, Ty, saw the mother and her two cubs lounging on the fairway of the 546-yard, par-5 hole. I am writing to introduce you to turfpathology.org, the new home for information on turf diseases in North Carolina. On this site you’ll find a wealth of information about diagnostics services, turf disease management, and our current research projects. In addition, we’ll be posting disease alerts, management updates, and other useful news on a regular basis to help keep the industry informed and up-to-date. I understand that most of us receive too much email as it is, so this is the last email you will receive from me unless you elect to sign-up for email updates. In addition to email, there are a variety of other ways to receive our news and alerts, just choose the method that works best for you! I hope you will take advantage of these tools to receive important alerts of disease outbreaks or updates on new disease management practices!Best wishes for a disease-free 2011! 12:00 NOON Tournament starts for the ENCTA Member championship. 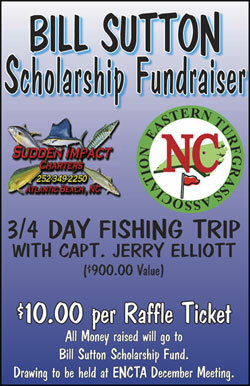 The Eastern North Carolina Turfgrass Association is presenting its First Annual Bill Sutton Fishing Trip Raffle for ENCTA members and anyone interested with helping the Bill Sutton Scholarship. Jerry Elliot with Elliott Enterprise Fertilizer Company has graciously offered his services as a Captain on his charter boat “Sudden Impact”. The lucky winner will have an opportunity to take three of his friends on a 3/4 day fishing trip out onto the blue Atlantic Ocean waters off the Morehead City shoreline. Caption Elliot chartered these waters for years and knows where the big fish like to go. This trip is valued at $900.00. The drawing will be December 15th 2011. All proceeds will go towards the Bill Sutton Scholarship that is given every year. If you are interested, please log on to www.encta.org website and contact any one of our Board members listed in the Directory. Raffle tickets are $10.00 and you can buy as many as you want. Remember anyone can buy a ticket. Download Poster (PDF Format). I would like to give a special “Thanks” to Jim Hoffman and the Clubhouse staff for the hospitality given at the ENCTA March meeting. The lunch and professionalism shown to the membership was top notch. Tom Reil with North Carolina Lake Management and Cliff Edwards with Premier Ponds gave educational information on topics for aquatic weed control and managing fish and their habitats in ponds and lakes. This is a job well done, guys. The ENCTA would also like to recognize Roger Olmstead with his new job position at Reedy Creek Golf Club, in Four Oaks, North Carolina. I know the ENCTA membership is happy to have you back in the Eastern Carolina. Also, Brad Brooks, CGCS, former Superintendent at Carolina Colours in New Bern will be stepping in a new adventure with Hendrix and Dail, Inc., located in Greenville, NC. Brad will still be a member of the ENCTA and will offer superintendents all around the area turf management services. Best of luck! I hope everyone has a great spring season and look forward seeing you at our next meeting.